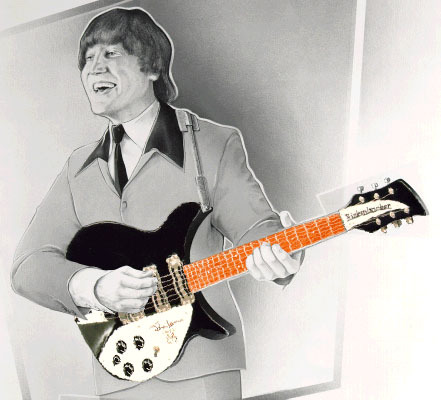 Rickenbacker International Corporation announces the acceptance of orders for the John Lennon Limited Edition. As a rock 'n roll legend and spokesperson for world peace, John Lennon used the Rickenbacker sound almost exclusively during his early days with the Beatles. The John Lennon Limited Edition, Model 325JL, is entirely handmade in America from solid Eastern Rock Maple with a rosewood fingerboard on a three quarter scale neck complimented with three vintage Rickenbacker pickups. The instrument comes standard with vintage vibrato. This series offers features which make it unique within the Rickenbacker product line. The Company located some of the original tooling to insure faithful recreation of the headstock, pickguard and nameplate. Also offered are the 355 JL and the 355/12 JL. The 355 JL is a full scale version of the 325 JL and the 355/12 JL is its 12-string compliment. Both guitars feature trapeze tailpiece. A special "vintage" case will be available with silver covering and crushed velvet interior similar to the original. The Company will manufacture only 2000 instruments from this series. The models will be formally introduced at the 1990 Winter NAMM Show in Anaheim. Pricing will be announced at the Show. Each guitar will be accompanied by an individually numbered Certificate of Authenticity and Origin. Production deliveries and certificate numbers will follow order sequence. Unit number one was delivered to Yoko Ono, who reportedly had the instrument specially decorated by artist Peter Max, before presenting the guitar to Sean Lennon as a birthday gift.